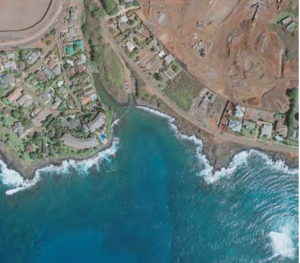 ￼Hanakaʻape Bay/Kōloa Landing, appropriately nicknamed “whalers cove,” was once a thriving deep‐￼water port, first used in the fur and sandalwood trades before it was discovered by the whaling industry, ￼then increasingly used by the sugar industry. This port grew in use after it became known that the port at Waimea was often affected by ￼unpredictable onshore Kona (south) wind conditions that made for a difficult entry and anchorage; ships could come to anchor and depart in normal and “Kona” wind conditions. Likewise, Hanakaʻape was situated near a source of good water, near crops grown in the Kōloa field system, close to salt beds and had an abundance of firewood and beef from mauka regions. In the mid 1800s, Hanakaʻape Bay/Kōloa Landing was the third largest whaling port in all of Hawai‘i (behind Honolulu and Lahaina) and the only port of entry for foreign goods. The sugar industry increased its use until 1912, when better facilities became available. Up to 60 ships a year anchored here to stock provisions and take on passengers. ￼Goods and people were transferred by hand and small boat to ships in Hanakaʻape Bay. The cove is at￼the mouth of the Waikomo (entering water) Stream on Hanakaʻape (headstrong) Bay.